This young man will likely never forget this fishing trip with his father, and I hope he carries something he learned on this day of fishing with me into his future and someday shares it with his own child or other children he comes to know. 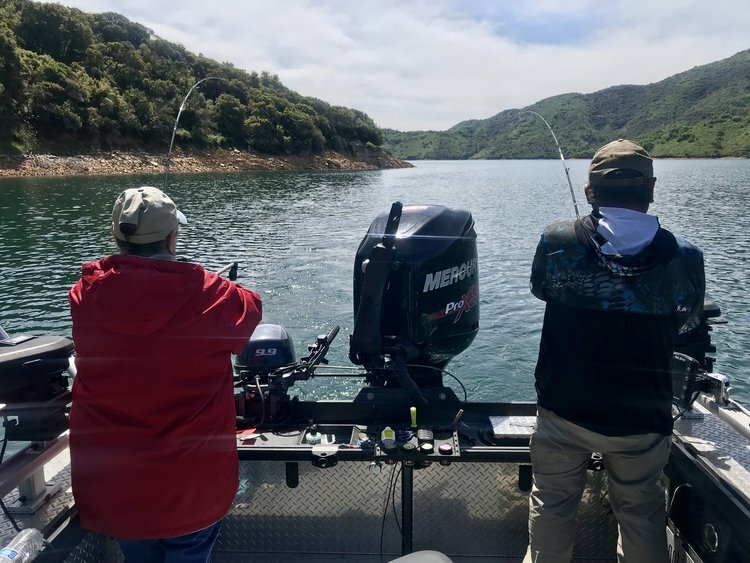 The 2018 spring fishing season is in full swing on Shasta Lake near Redding, Ca. 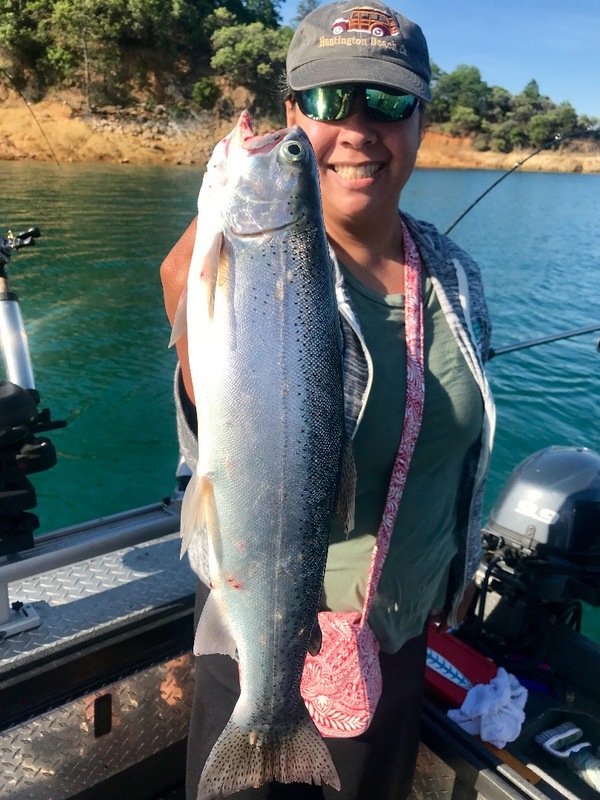 and we're just weeks away from seeing some of the very best trout and King salmon fishing Shasta Lake has to offer all year. When I moved from the north coast to Redding in 2012, I had no idea that Shasta Lake would become one of my favorite places to fish. Nearly six years later, Shasta Lake has not only become one of my favorite places to fish, but it's also proving to be the biggest venue for my fishing guide business. People from all over the country are sending me messages or are calling to ask questions about fishing trips this summer on Shasta Lake. The houseboat trips have been huge, but I'm finding most of my trips are all about spending time with family. It has been, and will continue to be, viewed as a privilege to share these days on the water with all of the fine people that come out to fish with me. I've been humbled by the notoriety and the amount of work Shasta Lake has provided and am so grateful to all who have chosen to spend a day or more of their lives fishing with me, and to pay me a good living in the process. During the spring months, Shasta Lake undergo's a big change in that water temperatures that remained in the low 50's for most of the winter begin to warm. The warm water triggers and springs to life the food chain in the lake which is so important for so many reasons. Both the German brown and rainbow trout spend most of the late fall through early spring in the upper tributaries spawning. After the spawn, these exhausted and very nutrient deprived fish make their way back to the lake to replenish and restore their physical health. They do so by foraging and finding food sources which are high in protein content. Fortunately, this spring period is also when the shad, planktons, and other food sources increase in numbers through reproduction and lake water conditions they also thrive in. The lake will give away its secrets to success during this timeframe and everything will be told from what you observe. The two most important things to consider are the water temps and the location of the bait. Find the right water temps and you'll find the bait. When you find the bait, the fish will be nearby in the water temps they feel most comfortable. The two most effective ways to find trout and baitfish are with your visual observations above the waterline and below the waterline using sonar. These two very important pieces of the puzzle are critical to pay close attention to. Because this article is about spring fishing, I will explain what conditions to look for and where during the months of April through early June. 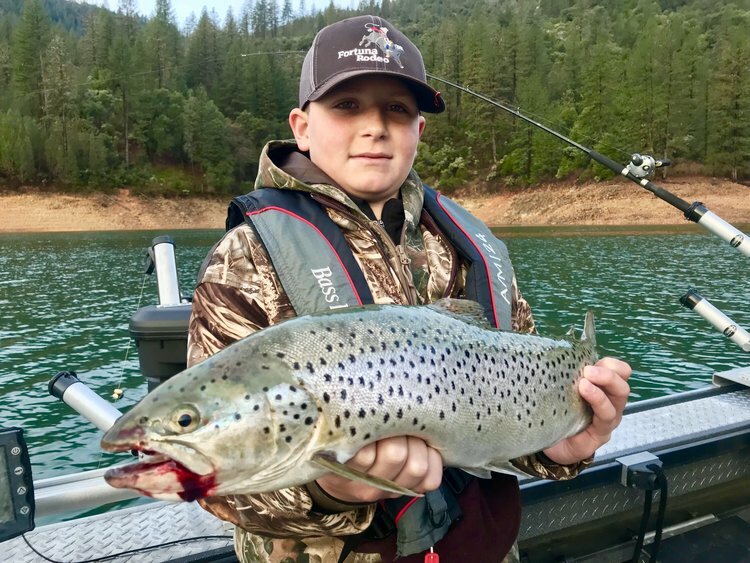 The conditions on Shasta Lake vary from year to year, but, in general, when the water surface temps begin to rise, the winter trout and bait patterns will in fact change over to a spring pattern. Trout love shad and shad love warm water. When the surface temps begin to rise, the first areas you will want to look for bait fish will be near the shoreline and coves where the water will heat up first. The Shasta Lake arms and shallower areas are the first place I go when looking for spring trout because that's where the shad balls will first be visible after wintering in the deep dark depths of the lake. Many days will be spent high in the lake arms chasing trout. The two temperatures you need to know the location of in Shasta is 54 degrees and 65-70 degrees. ' Right now, the trout will be hanging out in the cooler water near shore where they can just swim up and readily eat through schools of shad when they pass by. It is my observation that the shad will be on the move all spring and so will the trout. How Do I Catch the Trout and Salmon? 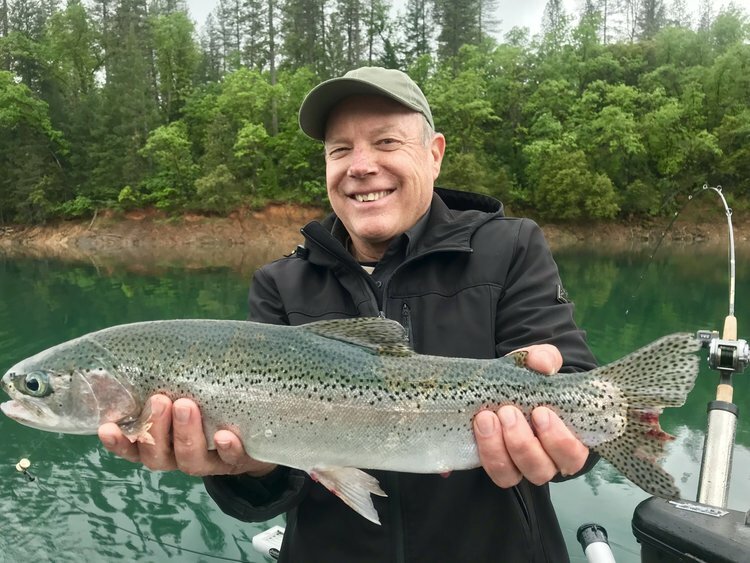 It is my opinion that trolling for trout and salmon in Shasta Lake is undoubtedly the best way to catch fish. This technique can be especially important during the spring months when the trout/salmon and bait are so spread out this time of the year. Covering lots of water and lots of depths are the main formulas for success. One of the main reasons I like to troll big spoons like the Trinidad Tackle Optimizer, is because you can cover miles and miles of water that you just can't when trolling or fishing from shore. Big trout and salmon in Shasta are hunters. To catch them, you have to beat them at their own game. Depending on water temps during the spring transition, I will use side planers, downriggers, Eco line weights, or even just top line the surface to find the fish. There's a thousand things to use to get bites, but they are all presented by trolling. I tend to troll spoons or bait as a single presentation during spring. The fish will be near the surface and will have plenty of light to visually locate your offerings. It's not until the fish start to dive deeper that I will add dodgers/flashers to attract fish that are deep and in low light conditions. I typically troll at higher speeds in the spring, probably because I have less gear in the water. When you don't have dodgers or flashers, running speed isn't as critical because you're not limited by the speed at which the gear will effectively run at. I generally run 2.0-2.5 mph during most conditions in the spring. The only exception is when trolling all Optimizers and I like 3.5-3.8 mph when trolling them. Bait can also be a great option and I think rolling shad is one of the best trolling bait options out there. Running shad in spring is a top producer because it's the top choice for trout and salmon right now. Nightcrawler worms trolled alone or as an addition to a Arctic Fox Trolling fly can be deadly as well. If you are looking for spring salmon, I highly recommend shad or anchovy rigs to have the best chance at catching them. I like to roll shad on a double hook rig or an anchovy in a Trinidad Tackle Bait Head. Salmon and trout can't resist the smell of fresh meat and the flash and roll of real bait. Where Did They Go and How Do I Find Them Now? Like I explained earlier, the spring pattern is continuously under change because of the water conditions and bait migrations. Just when you think you have found the fish and have them locked in at a certain depth, they disappear. This can be frustrating, but thankfully it's only for a short period of time during the spring season. After the weather patterns stabilize and a warm water layer develops on the surface, the fish will settle in and the fishing will really take off! Once you establish a good depth for the bite, it remains pretty close to the same day after day, but will slowly go deeper as the surface temps get even warmer. This lake water thermocline will sort of lock the fish down into a smaller area and will generally be in the main body of Shasta Lake. After spending months up high in the arms, by June-July I'm fishing the same water nearly every day. Working through this spring transition period is very frustrating. but after a few years you'll have a far better understanding of how to effectively stay on good fishing when the lake is void of other trolling boats and recreational water users we typically see in the summer. 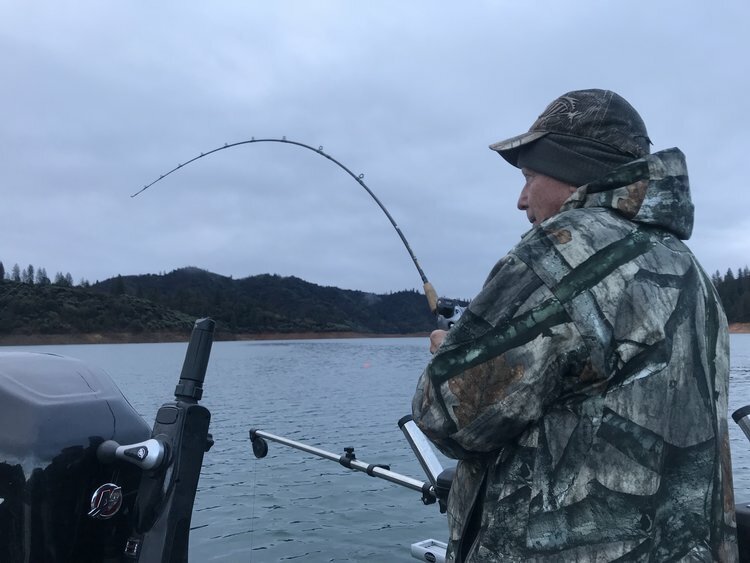 I hope this information helps to bring some understanding of how to fish Shasta Lake in the spring and what considerations should be made before heading out or throwing in the towel after the fall transition. Shasta Lake is a world class fishery and its angling rewards can be extraordinary. Persistence pays big dividends in the spring, but if you are out of area or just don't get out enough to stay on top of the good fishing, please feel free to send me a quick message or call and I'll do what I can to help. Better yet, book a trip with me and you'll have 8 hours to pick my brain and to accelerate your knowledge of Shasta lake trout and salmon fishing. Sharing my fishing knowledge with others is a character trait that I hope will continue with future generations of anglers and will be one of the most notable gestures I will have offered to others long after I'm gone. Sac River football (fat) rainbows!